"The only bass plug-in you need? Absolutely… if you can't find the bass you need here, you're doing something wrong." "A musical instrument that begs to be played, Trilian isn't just the best bass instrument on the market, it sets the gold standard for years to come." "The fact that Trilian is so well integrated with Omnisphere is really a plus in my mind. This takes it to a whole new level." 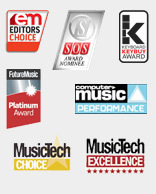 "Yet another triumph for Spectrasonics… an exhaustive collection of some of the best bass sounds we've ever heard... Easily the most comprehensive source of bass sounds." "A dream come true for anyone seeking acoustic, electric or synth bass sounds."